I am not sure what the weather is like in your neck of the woods right now but here in Philadelphia we just experienced a week of record low temperatures. 2014 has brought with it snow, ice, and sub-zero temperatures. In these temperatures even the projects in the garage go unattended in favor of strong coffee and a good book. On this frigid, Saturday morning, I went for my well-worn copy of “Jupiter’s Travels” by Ted Simon. I have already read it more times than I can recall. In case you are not familiar, “Jupiter’s Travels” is an account of one mans four year journey around the world. In the beginning of the book there is a picture of all the gear he took with him and it is a vivid reminder that of where “Adventure Touring” got its start. His jacket was nothing more than a leftover from the British Royal Air Force. I recently saw a clip of Ted Simon trekking across a rocky desert and he was outfitted head to toe in modern riding gear. There is no touring gear available for purchase that is more advanced in its technology and design than what is being released by Rukka. Taking an uncompromising approach, Rukka uses only the best components to create jackets, pants, and gloves that offer riders the highest quality finished product possible. For 2014 Rukka has set out to introduce new models into their American lineup in an effort to provide the US consumer more flexibility and options within the brand. One of the first jacket and pant combinations that we will be seeing in the new year will be the Armaxion. Meant to offer riders a less technical and more affordable version of the Armas, the Armaxion is a fantastic jacket and pant combo in it’s own right. Sharing the same composition as the Armas, the Rukka Armaxion Jacket features a Armacor shell with Gore-Tex Pro 3-layer protection built in. Armacor is an abrasion resistant fabric that is a combination of Kevlar fibre with Cordura reinforcement. The Armaxion’s removable liner is not made from Outlast material like it’s bigger brother but rather it is a Thermoreflective 60 gram insulated lining. The idea is that it reflects heat back toward the body keeping you warm when you need it most. 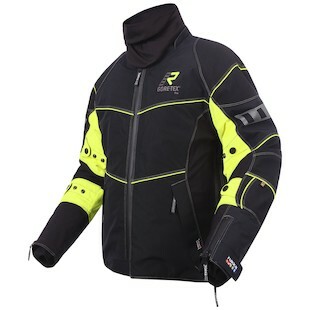 Airflow is provided via two large vents located on either side of the jacket to keep the rider cool when temperatures warm up. The main zipper, as well as the zippers at the cuffs, are waterproof, making the Armaxion one of the most sophisticated jackets on the market for battling the elements. Even the detachable collar is Gore-Tex. Whereas the Aramas is going to be a Four Season jacket with all of its advanced venting, the Aramaxion is going to excel as a Fall, Winter, Spring Three-Season cold weather jacket. It is designed to couple perfectly with the Rukka Armaxion Pants using a 270 degree zipper connection. 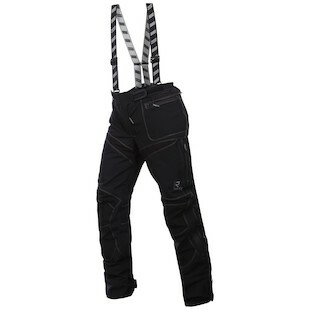 The pants also include removable suspenders to assure they stay where they are supposed to in the event of a tumble. They share the same Armacor shell and Thermoreflective removable liner as the jacket. Stretch panels at the thigh and knee allow for maximum movement and comfort. 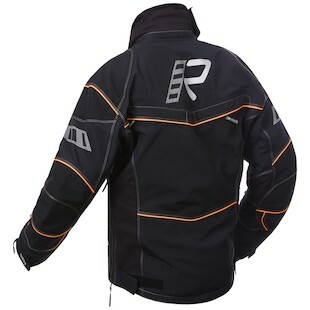 The pants have Rukka’s AirCushion system, which creates a climate buffer between the rider and the seat. In turn it helps to regulate temperature and reduce condensation that can build up after long hours in the saddle. The Armaxion pants keep the rider planted in the saddle using the Keprotec Antiglide system to ensure grip. Airflow is provided via ventilation openings at the thighs. For 2014, Rukka is using D3O armor which is a switch away from their RVP Air armor found in their earlier garments. D3O is top of the line impact protection and is a huge step up from the RVP of previous models. The Armaxion Jacket will feature D3O Air armor at the shoulders and elbows and will come standard with a D3O Central Back protector. The D3O can also be found in the Armaxion pants offer riders impact protection at the knees as well as the hips. Between the Armacor shell and the D3O armor this is one of the safest pant and jacket combinations on the market. If you have never read “Jupiter’s Travels” I would recommend it as a must read for amateur and advanced touring riders alike. Whether you are heading out for your first long weekend road trip with your buddies or taking a solo expedition to explore Coastal Peru after a grueling ride through Central America, Ted Simon departs hard earned wisdom in this enchanting tale of adventure.